Most iPhone users have trouble-free use of their device whether it’s on a cellular connection or wi-fi, but wireless connectivity issues do occur from time to time. These type of problems can manifest in a variety of ways; sometimes the Wi-Fi on and off toggle switch is grey and unusable (sometimes resolved by simply quitting the Settings app and relaunching), sometimes the iPhone will appear to connect to a wi-fi router but no data will transfer, connection speeds are unusually slow, and other times the iPhone will simply refuse to connect to a wireless network at all. There isn’t a single unifying cause for these issues, and wi-fi connection problems can occur completely randomly, regardless of an iPhone model or iOS software version. We get a lot of questions about connectivity problems, and for most cases it’s an easy fix that is resolved quickly with a reboot or dumping network settings, but more stubborn cases may require a full software restore, while in extreme and rare occasions, contacting Apple’s official support channels is necessary due to actual hardware problems. 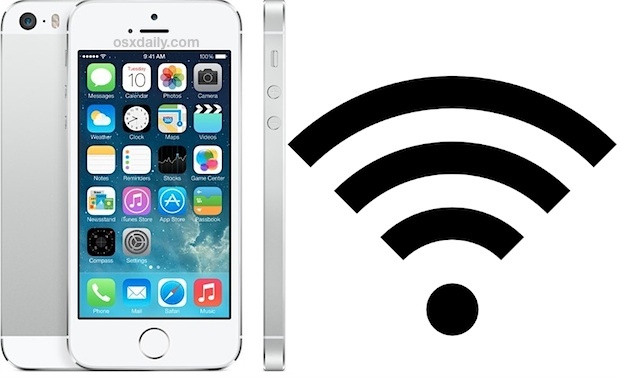 If you run into wi-fi problems with your iPhone (or iPad and iPod touch for that matter), try out the following troubleshooting tricks to resolve the problem. Once the iPhone boots back up again, attempt to use wi-fi again. In some cases this fixes the issue immediately. When the network settings have finished resetting, try connecting to the Wi-Fi network again. Things should be hunky-dory at this point, but if not there remains a few other choices. This is not an overly complicated process, but it will take a little bit of time depending on how much data is stored on the iPhone, and depending on which method you use. A variation of this trick involves resetting the iPhone to factory default settings and setting it up as if it was brand new device. That adds another step to the restore process, but if wi-fi works and connections are fine under factory defaults, you can usually safely restore from backups. On the other hand, if the problem is fine under factory settings, but persists after restoring from the backups, you may have the very unusual situation of a corrupt backup, a rare situation. 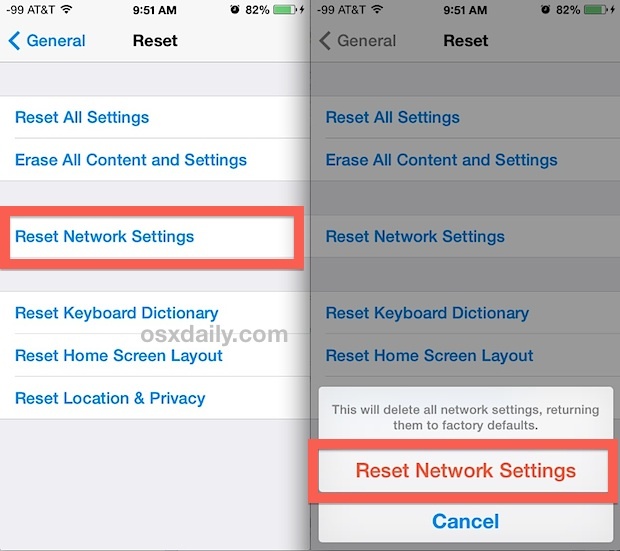 If the iPhone continues to have wi-fi connectivity issues, you may want to reset the actual Wi-Fi router itself, by turning it off and on again, some wi-fi routers are known to be finicky with iOS and can sometimes be the source of the problem. If the iPhone connects to the router but speeds are very slow, an effective strategy can be to use custom DNS through a provider like Google or OpenDNS, though such an issue is usually representative of an ISP (internet service provider) problem, and not an actual issue with the iPhone or wi-fi itself. If other iOS devices and computers connect to the wi-fi router and work flawlessly but the iPhone still won’t after trying the above steps, it may be time to contact Apple official support channels to determine if there is a physical hardware issue. Apple has an automated online troubleshooting guide that will gather data directly from the iPhone and attempt to remotely diagnose issues, but you can also just call a support line directly or visit an Apple Store. It’s fairly rare for the iPhone to have physical wi-fi hardware problems, but if it does and the device is under warranty, Apple will usually replace the phone quickly. Just be sure to back up the iPhone before sending it into Apple so you can restore where you left off. Before resetting the settings I would first select the offending wi-fi network. and click on the Forget this Network then quickly set the network up again, I find this often works when networks are misbehaving. Just a small step but might save resetting everything. I checked out several options and the only one that I found that worked was to power the phone off and then place it in a freezer for 15-20. When you power it back on, the wifi should be able to be turned on. I did it over one week ago and it is still working. I am able to turn the wifi on and off without any problems now. Some sites I found suggested that you heat the phone up with a hair dryer until an ‘overheat’ warning pops and and then put it in the freezer. If didn’t try this because heat typically shortens the life of a battery. Thus, I tried just the freezer attempt first. As well, I can’t say for sure, but it seems to be almost exclusively with the 4S that the problem occurs. This was my final resort today – heating the 4S with a hair dryer till the overheat warning came on, then turning it off, and putting it in the fridge for 20 min; then turning it on – and guess what – the wifi button had magically reappeared, and the wifi worked! I can not get wi-fi on my iPad or my iPhone 6 I reset but still not working. I had an iPhone 4S that worked perfectly for 3 years. I took it into Apple to get a smashed screen repaired, and stupidly, stupidly said yes to buying a replacement 4S instead. The next week I left for an overseas trip and a week later the wifi greyed out. I called Apple (who confirmed it’s their problem!) but the countries I’m in have no official Apple stores so there’s nothing I can do about it. I also had this happen to two friends. So irritating. It’s now been 9 months. So much data. So many apps to update. So much Apple hate. Iphone 4s wont start up without connecting to wifi …. Whe you hold the power button down the phone comes on , asks the language questions and then says connect to itunes or use wifi …. i dont have both how do i start it up? ian, i am pretty sure you are able to skip this step !! Wow! We tried everything to get the wifi button to not be grayed out. What worked? 10 min in the freezer! Thank you for the suggestion! I’d like to add to those suggesting that you leave your phone in the freezer for 10 minutes or so. It’s the only thing that worked for me after rebooting the phone and resetting both the networks and all other settings several times. Thanks for all the suggestions!! 10 minutes in the freezer worked! I tried resetting the wifi, but that did not work. I powered off my phone and put it in the freezer for just over 10 minutes. Thanks for the tip! my iPhone 6 broke so I got another one and well I restored the back up but suddenly it asked for wifi network I skipped so I can set it up later than when I tried to set up wifi the button wouldn’t turn on, and no its not grayed out ,and yes I tried reseting network settings but nothing is working please help me!!!!! I am experiencing the same difficulties, would appreciate it if you shared your ways of fixing it with us.